Chesterfield 7 passes the Depot Gates at the Crich Tramway Village on 8th June 2008 - Tramathon Day. Chesterfield Tramcar 7 is the only preserved example of the 12 original tramcars built by the Bursh Company of Loughborough for the opening of the electrified tramway in 1904. 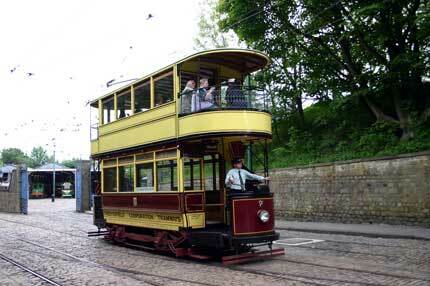 When built, it was a 4 window type tram with an open-top, however later on in it's life it gained a top cover and open balconies, as it is now portrayed at Crich. In 1916, there was a serious depot fire which destroyed 2 of the 12 tramcars and extensively damaged four, and badly effected the remaining six. Luckily 7 survived the conflagration to be sold at the system's closure in 1927. The tram was purchased my Mr. Eric Cocking in 1927 as his family's holiday home at Darley Dale on the Derbyshire Moors, and he had in fact ridden on it as a child! The tramcar was cut in two, and the two halves were laid side by side being converted into a holiday home and later the permanent residence of Miss Florence Sharpe. The tramcar was eventually bought by the museum, and went into store for several years, before the funds became available through the Tramcar Sponsorhip Organisation for it's restoration to operable condition. Thankfully, despite the tram being open to the elements for many years, much of the original paintwork remained on the side panels, and it was carefully copied. Parts were either obtained or copied, and sometimes both, and over three years and £250,000 later, Chesterfield 7 was returned to the operation fleet in 1997 and is now a popular addition to the fleet. It's eye-catching livery of chocolate and primrose further adds to it's status. Something not widely known about the tramcar is that it's truck was salvaged from Sheffield Corporation's 349, better known as the musuem's first generator car numbered 01. Author: Jack Gordon from sources Tramcar Rolling Stock Handbook, ISBN 978-1-90530-420-2, Museum Guidebook, 2003-2008.